Many thanks to all who have sent in these photos, please keep them coming in. 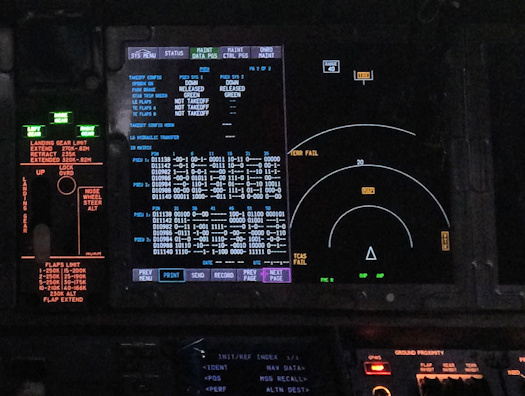 The Onboard Network System (ONS) monitors the aircraft systems hardware and software for faults and health monitoring and sends alerts to pilots and maintenance staff via the enhanced digital flight data acquisition unit (eDFDAU). It can store over 75 flight hours of data and analyse and trend that data in-flight on its data file server called the Network File Server (NFS). Amazingly by October 2017 the ONS Operating System software was already up to update 7.1. The big advantage of ONS over previous systems is that it collects and sends data from all monitored systems for viewing by pilots or maint crews either on the flightdeck display systems and/or at maintenance base, rather than maintenance crews having to locate and interrogate or BITE check each individual system component many of which were located in the E&E bay. 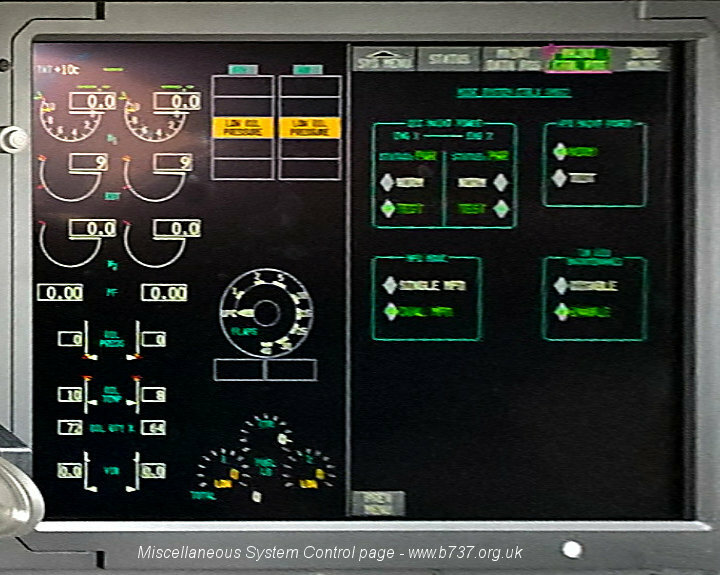 You get access to the ONS "website" either with the two inboard DU's of the MAX Display System (MDS) or a laptop/iPad via one of the two data ports, one on the flightdeck (underneath the data loader) and one on the NFS LRU in the E&E bay, or via WIFi. If accessing purely via the MDS you navigate through the pages and menus with the two selectors on the Forward Aisle Stand or P61 panel (under the dataloader). 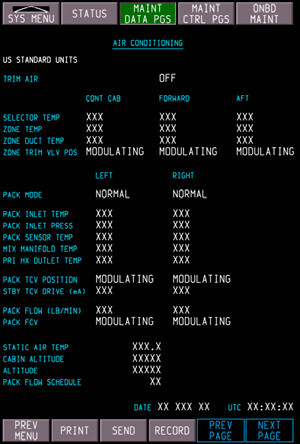 The ONS and MAX Display System (MDS) integrate airplane data collected during flight with a new Onboard Maintenance Function (OMF) that consolidates maintenance data for view on the flight deck displays and on portable maintenance devices, such as tablets (there is an iPad app called Boeing ONS Maintenance that anybody can download from iTunes). OMF began with more than 1,700 requirements from Boeing and took two and a half years to develop, programmed in just 32,000 lines of Clojure code. The OMF can report over 6000 error codes but it also takes specific conditions and sequences, combines rules and events, manages dependencies, and aggregates fault conditions. For more details on the ONS see this article from Boeing Aero from 2014. The maintenance data includes: • BRIGHTNESS • DISPLAYS • DPC DIGITAL INPUTS • DPC DISCRETE/POWER INPUTS • DPC DISCRETE OUTPUTS • EFIS CP TEST • MDS CONFIGURATION. 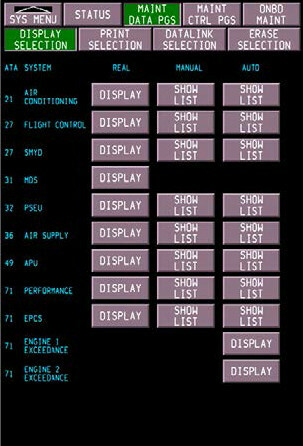 • DISPLAYS • DPC DIGITAL INPUTS • DPC DISCRETE/POWER INPUTS • DPC DISCRETE OUTPUTS • EFIS CP TEST • MDS CONFIGURATION. 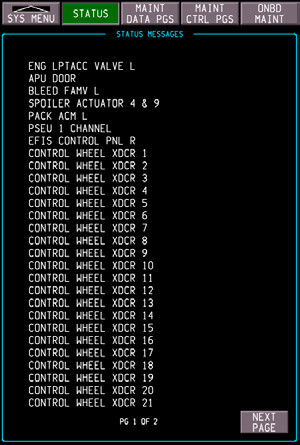 The Miscellaneous System Control page provides controls for setting either of the EECs or the APU into either NORM or TEST mode. 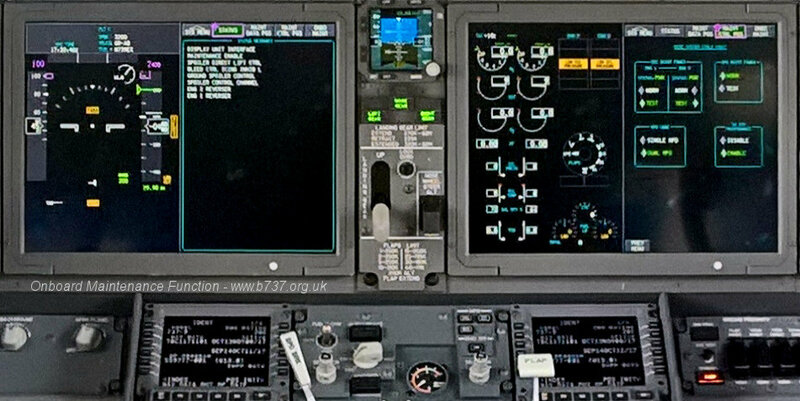 The lower selections are to choose Single MFD or Dual MFD Mode and to Enable or Disable access to Maintenance Page in Air (above 10,000ft only). There is also an optional "Enable Landing Capability Placard" for Cat IIIB aircraft (Not shown here). 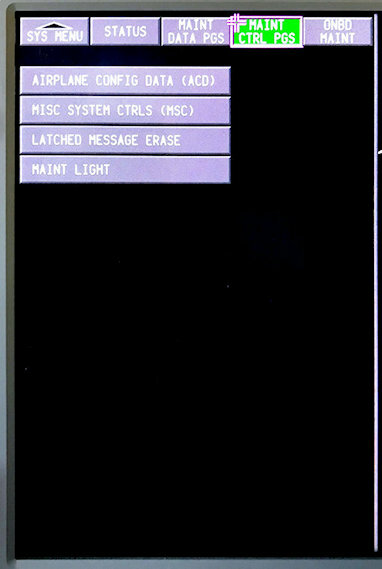 Selection of this menu shows three submenus: LINE MAINT, EXTENDED MAINT and OTHER FUNCTIONS. 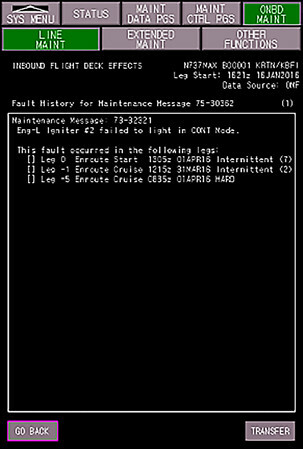 • Inbound Flight Deck Effects: This application available on the MDS and on the PMD, contains “in-flight” faults for the inbound leg (i.e., “leg 0”), grouped by FDE and sorted by time with the most recent FDE appearing first. 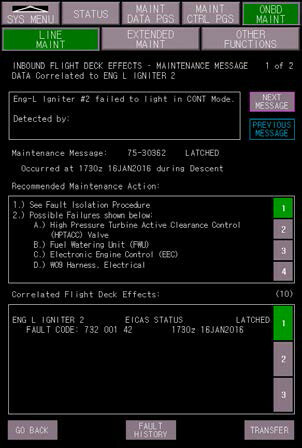 • Existing Flight Deck Effects: This application available on the MDS and the PMD contains faults that are currently active, grouped by FDE and sorted by time with the most recent FDE appearing first. • Ground Tests: This application shows on the MDS and on the PMD and contains all Member Systems ground tests available at the time the menu is selected, organized by ATA. • System Configuration: This application shows on the MDS and on the PMD and it contains all Member Systems configuration data available at the time the menu is selected. Configuration data includes the equipment part number, serial number, loaded software part numbers, and options data. Organized by ATA. • Fault Guidance: This application is on the MDS and on the PMD and contains general information about troubleshooting at the ATA level. • Crew Wireless Access Code: Is only available on the MDS. 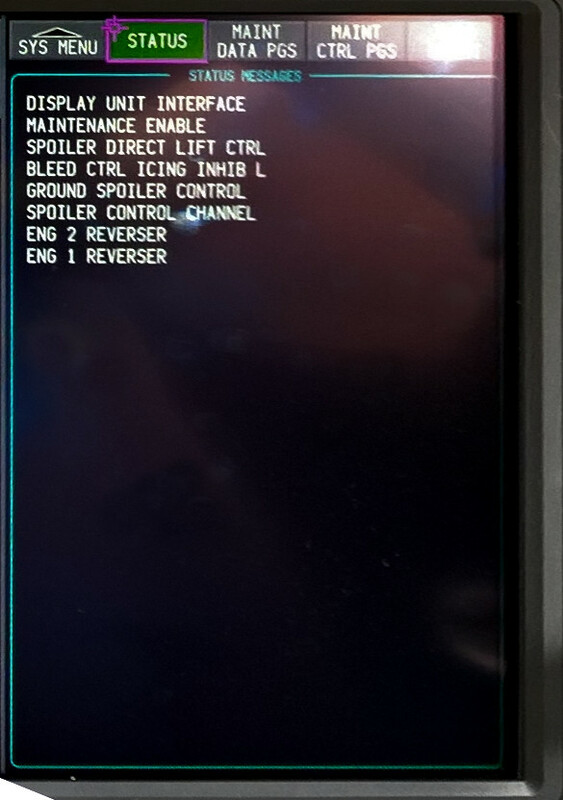 It provides temporary access codes that allow the Mechanic to connect the PMD wirelessly to the airplane's ONS System when the optional Crew Wireless LAN Unit (CWLU) is installed. 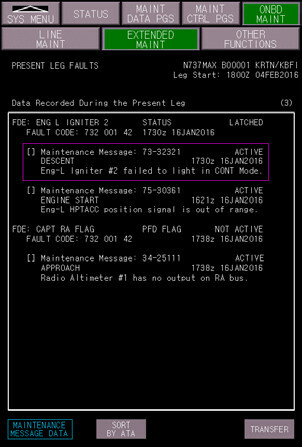 Line Maintenance > Inbound Flight Deck Effects: This shows a summary and status of all FDE's, date and time of recorded faults, fault descriptions, fault types, fault codes and maintenance message numbers, if applicable. AND any recommended maintenance action and possible causes.